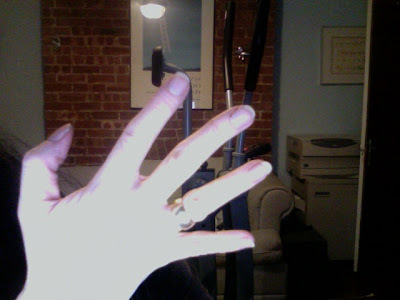 Hey, thanks to Alex Williams and novelist Amy Koppelman, my New Year's resolution about not biting my nails (See the photo? I succeeded!!!) made the NYT today! I tried for five years to stop this habit, biting off expensive salon nails, Lee press-ons, and chewing away the toxic liquid stuff meant to stop the habit. I finally succeeded two years ago with the help of Fred Max, a hypnotist (and my husband's cousin's husband.) he told me I would always have the craving, but the trick would be to find something I wanted more--like non-monstrous looking nails. Anyway, here is the story! Nine is my favorite number so I have high hopes for this year. Thank you all for reading my blog, for posting sometimes, for reading my books, for reading anyone's books, and for friendship, love, sympathy (and tea!) and everything else I can think of. Here's wishing all of you love, peace, grace, joy and a never-ending sparkle of magic. I read two fantastic books while I was in Boston, the first, Dear Everybody--I am going to have the author answer some questions about it for my blog. Then in honor of Max's star turn in You're a Good Man, Charlie Brown, I got the now-in-paperback and acclaimed bio of Charles Schulz., Schulz and Peanuts by David Michaels . Fascinating and insightful, and also a whole lot of fun. And what thrilled me the most was that my 12-year-old son saw me so engrossed that he now wants to read the bio himself! So now, after four days away, I have to get back into my writing routine, and my freelance routine. I told Jeff today, that if I didn't have all this freelance, I could write a novel every year or two years like other writers. I wonder about the toll trying to make a living takes on writers? I always try to do my writing first, but sometimes, with deadlines looming (right along with bills), it isn't always possible. How does anybody do it all? 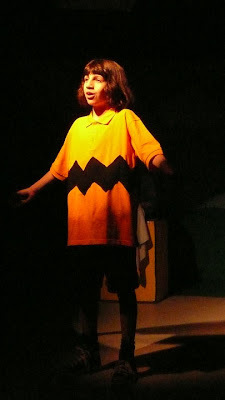 Max's performance as Charlie Brown in the theater company was amazing, so please click and take a look. I believe he is the most spectacular thing since chocolate. Jeff and I are in awe of our son. I loved all my holiday years in the thick of Manhattan. My friend Beth (also Jewish) and I lived across the hall from each other on 24th Street and we would cook in our tiny apartments, with our doors open and invite everyone in for food and by the end of the evening we were both giddy with happiness and this warm sense of NYC family. I have spent Christmas at the movies with men I have loved. And with those I tried to and failed. I spent one Christmas Eve (Oh wait, maybe it was New Year's) watching the fireworks in Central Park, which is usually remarkable, but it was with the wrong person so it was lonely and terrible and trapped, and there was a deliberate withholding of a kiss for me and some cruel words were spoken to me, so I bit down tears while everyone else was laughing and hugging and melding into their own kisses and I kept thinking: I can't start the New Year like this. I had another boyfriend one Christmas eve who took me to his office, where I saw, for the first time, a photo of the wife and child I didn't realize he had--the wife and child he should have been with that evening. I took a cab home and never answered his calls. I spent a Christmas in Paris! Now, that I am a family girl, we have rituals. When Max was little, we used to give him equal opportunity holidays, Christmas and Hannukah both. He wrote letters to Santa and we always wrote him one back on letterhead (From the Desk of Santa Claus.) And every year, Santa brought him a vegetable in his stocking. One Christmas, we came down to find Max, at three, so proud of himself because he had opened the presents himself. But we saw that he had used the scissors to cut the wires on the special art projector thingie he had wanted and now it wasn't working. He was so happy we couldn't tell him he had down something wrong! So we blamed it on the toy and bought him a new one. By the way--Max's final performance as Charlie Brown in his theater company? Now that Max is 12, we have....Chinese food! Movies all day! Walking around the city! Stopping for Ethiopian food! More movies! Forget bah humbug. I love Christmas. And psst, want to learn to write? I'm in the midst of teaching advanced novel writing through UCLA, but I have a beginning course starting up January 14. Check it out here. Writers always have to figure out additional ways to make ends meet, and my friend, novelist Masha Hamilton, has come up with an unusual way. If you or anyone you know is headed to New York City, tell them to take a look at Sterling Bed and Breakfast. 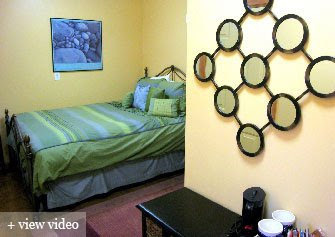 It is a boutique bed-and-breakfast in a lovely turn-of-the-century townhouse, great location super close to subways (Manhattan is 15 minutes away) and within walking distance of the Brooklyn Museum and Botanical Gardens. It features artwork by the very talented Erica Harris. There are three beautiful rooms, and for breakfast, expect homemade pastries along with cereal, yogurt, hard-boiled eggs, fresh fruit and more, as well as individual help and attention if you need to figure out how to get where you’re going or when the museum opens. Sterling gets lots of visitors from overseas as well as the U.S., and reports wonderful breakfast conversations in the dining room about everything from politics to art. If you’re headed to New York for business or pleasure, take a look at Sterling. If you mention my name, you get a special winter rate: $150 per night weekday, $165 weekend. This includes taxes and the expanded Continental breakfast. Plus, Masha is absolutely WONDERFUL. Oh yes, it snowed again! This amazing image on top is part of a gift of Numi flowering teas I received from a beloved friend. They are AMAZING. 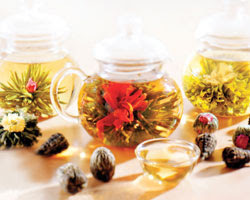 You put the bud in hot water (and the teas come with a little perfect glass teapot) and they slowly unfurl into bursts of color--plus the teas are delicious! We also got a gift of a dozen oranges and tangerines, so now we can have tea and oranges, like like the Leonard Cohen song! 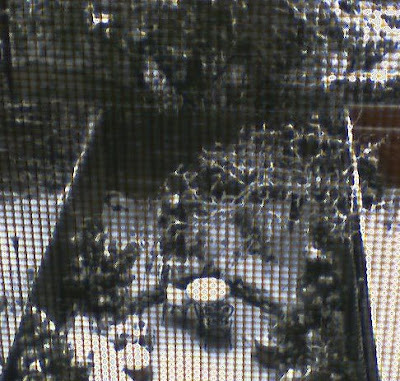 This through-the-screen shot (I am too cold to open the damn window) is of our urban backyard and the little iron table covered in snow. You can't really see it, but there is this beautiful little bluestone wall by the table that separates our garden from the rest, which is brick, with all sorts of plants lining the edges. It all leads up to a wood deck and then to our beloved house. The wood fence is one we put in when we first moved, unlike the neighbors' low wire numbers. We wanted privacy, which we get, but the neighbors who lived there were upset, and one even tried to stop us from putting up the fence. That particular neighbor is gone now, replaced by ones who also like privacy. I know it looks scrubby now, but when it is green and lush with plants, it is an amazing little oasis of green in the city. And we are all off to another show with our star boy Max, this time with relatives, and then tomorrow is the closing night, and my niece, whom I adore, is coming with her husband. This means Jeff and I have been cleaning the house like banshees, which isn't easy when you are pack rats like we are. I still managed to write 800 words yesterday, between cleaning my office and the bedrooms for company! I'm happy, too, because I have some things coming out: a personal essay in Hallmark, another essay that Scholastic asked me to do, and my Grief Diet essay, which is getting some buzz (if you scroll down, you can find the link and read it. Email me if you can't!) If you're a writer, you always want to have something out there because that something usually generates other things, and at the very least, it makes your endorphins rock and roll a bit. That's the boy, Max Henry Leavitt Tamarkin, being a STAR as Charlie Brown in You're A Good Man, Charlie Brown. The theater company, run by the incredibly talented Chase Leyner (sister of Mark Leyner), requires auditions or invitations, and it has a great stage, reasonable prices, and cupcakes (!) at intermission. It was a packed house, front row center seats and I think the most amazing moment was towards the end when Max had his big show-stopper of a number, singing as he came onto the stage, the last one out to be applauded. (His dream was to finally get to be the last one applauded.) He looked almost overwhelmed with joy and astonishment, which of course, made me cry. Jeff and I are no strangers to working for what is right. Especially in the city we love. We fought long and hard to get the head of our son's school out (long story, involving hate mail stuffed in our door for our efforts, threats, and eventually a fantastic new head) and we worked long and hard to get Obama in. Now, we are battling the mayor, who bloated the budget and mismanaged things so badly, the state had to come in and take over. Taxes were raised a whopping 47% and now the mayor is talking about doing a reevaluation of property, which would kill us, since the 1865 brickstone we bought in 1993, at a low price and low taxes, is now worth about 6 times as much. A neighbor told us she expects the taxes on her place to go up to 30,000. Surely, this cannot be true! I have no idea where we could even move if we had to. We were priced out of Manhattan, the city we adore. Brooklyn is just as expensive as here, and so is Jersey City. We are not small town or suburban people, and living in the country would just give us hives. (No offense to anyone who loves living there.) Plus, we renovated our home, rebuilding it. We married while living here. 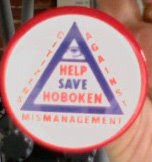 We had our child here and published our books and we love Hoboken. Despite, the corruption going on now, we love it and want to heal it. So, we joined forced and protested at City Hall with about a thousand others so far.) We joined groups! We learned disturbing facts! Turns out the mayor is paying the head of the fire department more than what the head of NYC fire department makes. Many more people are employed at high salaries than is needed. City hall salaries could buy everyone in the city a small country of their own. And there is the matter of a million dollars missing....hmmm, wonder where that went? If anyone has ever gone through a reevaluation, would you let me know about it? Otherwise, where is the Valium, the industrial strength kind? And the dark chocolate? The 70% kind? Uh oh, it's that time. New Year's resolutions. Some great news is that I am going to be included in a NYT article on resolutions, thanks to the brilliant writer Amy Koppelman (thank you, Amy). So what are my resolutions? 1. I want a draft of my new novel done before Breathe comes out. Being a writer is the most wonderful job in the world. You get to tell the deep truths about life and about people, to get at the heart and soul of what it really means to be human and if you are lucky, you can turn some experiences into art. 2. I want to finish my scripts! 3. I want to stay strong physically and I want to do everything I can to make my family happy. I came to a happy marriage and a fabulous child late in life, but I like to think that everything awful that came before--a painful divorce, a death of a loved one, a year long critical illness, and terrible relationships-- was prelude to this astonishing joy. Maybe all those things made me who I am so I could have this. 5. I want to learn to knit fingers on gloves! 6. Jeff told me that I should also put that I resolve to stop balling up my socks in the laundry. So.please feel free to tell me your resolutions, and yes, I probably will still ball up my socks. through 2009. Clea Simon sent me this poem on writing (Adam's Curse by Yeats) and I love it so much that I am reproducing it here. This is for all the writers who were ever asked, "But what do you do all day?" or were told, "You have it so lucky! You get to stay at home and just hang out and write." There is also my personal favorite, "Oh, you're a writer! I am going to be when I have enough money to retire!" I think people love the idea of writing, but they don't realize just how hard (and wonderful) it is. The Martyrs call the world. Hey, some days I am willing to try anything. I am falling in love with the title Keep me Awake, which is from an old jive song that has the line "keep me awake so I can memorize you." The title was a fabulous gift from a writer friend. How fabulous is that? Titles are hard for me. For the longest time, the novel that is coming out was called Traveling Angels, which I loved, right up until Algonquin told me it wasn't strong enough, but I love and trust them, and they suggested Breathe, which seems exactly perfect to me. I must admit I love my office. We live in a city, in an 1865 brickstone and the whole third floor is my office, a hallway, a bathroom, and then Jeff's office. (We can wave to each other as we work.) My office has a brick fireplace, wide plank wood floors, a couch for me to nap when the going gets too rough, two windows that look out on our urban backyard (the size of a postage stamp, but we still have a peach tree and fresh herbs growing). I have all kinds of gadgets and gizmos here: wood finger puppets Jeff bought me on a third date, wooden monkeys, 75 snowglobes, books, a birdhouse, a bulletin board full of old photos and notes, exercise equipment, wind-up toys, rubber lizards, and these beautiful gray-blue walls. I love my Mac, love my big wide desk, love the calendar I tape up to a filing case so I can see what I forgot to do three days ago. I'm passionately curious about other writers' offices, so if you want to describe or post a photo, I would love it. Do you work neatly and productively? Are you a big messy writer like I am? Do you need your clutter or do you like a pristine work space? This is from Roy Blount, president of the Authors' Guild. I love it and I'm reposting it. Book amnesia and Grief Diet on yet another site! I wanted to talk about book amnesia. As soon as I finish a novel, I forget how difficult it was to write it. (They say that about giving birth and/or pain, but I have not found that to be true. Giving birth was bliss for me, and I have had my share of terrible physical pain and I remember that to the wince.) I create a false memory about writing my novels. I imagine that my books flew onto the pages, the characters fully alive, and as soon as I have positive response from someone, that cements this fallacy even more. So here I am, waiting publication of Breathe and working on a new novel, and all I can think is everyone else out there is writing harder, more disciplined, better, faster, more alive than I am. I am at my desk for hours, I turn out 1500 words, and I think, surely that is not enough. Surely every other writer is turning out 2000 or 4000 or even 6000. I think something is off about my plot, something is wrong with my characters, the whole idea that obsesses me won't obsess anyone else. So I posted on facebook and instantly heard from other writers who felt the same. I emailed writer friends who reassured me that this is the writers' lot in life, that yep, they feel the same way. 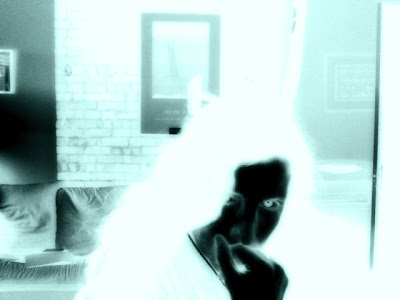 I think the only thing to do is write, to block out the voices and the fear, and to dig deeper into the story. Already I am in too deep to let it go. It's a story I want to read, I want to find out what happens, and I want to write it. The photo above is of brilliantly talented author Amy Koppelman. I raved about her book, I Smile Back, in this blog a few posts down, but so did Elle, PW (they called her prose "spare and crackling"), Library Journal and more. 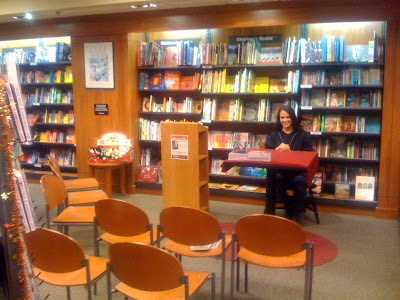 This picture is Amy at her reading, gamely sitting there with a fever, smiling at the empty chairs. I wanted to run this (and Amy graciously agreed to let me) because, this is a problem that happens to every writer I know. I know. I've had it happen. Twice. I read in a Princeton Barnes and Noble once and not only did no one show up, but the staff felt so sorry for me, they sat down in the front row, complete with name tags! I read in Philadelphia and no one showed up, but at least we ended up going out for a nice dinner afterwards. Michael Dorris, husband of Louise Erdrich, who usually got 500 people at every reading, told me that he once walked into a room to find....four people. Gamely, he read, and then the cops came in and arrested three of the people. They were bank robbers on the lam, who figured a bookstore reading might be the last place anyone would expect to find them. You need to do readings. You get to sign books which gives them a more prominent place in the bookstore. You get a bit of publicity when the store advertises you, and you get to meet the store people who might like you and your book enough to do some hand selling. But, readings can be traumatic. I've had a packed house in a blizzard, and yes, there were two times (Two! How traumatic is that!) when no one was there but me, my husband, my son, and the staff. I love reading with another writer because there is so much less stress, and I love reading when there actually is a crowd because then you get to meet and talk to your audience, who are usually wonderful. I get so jazzed! I love doing panels at book fairs like Backspace or AWP because the audience is so interested and interesting. Most of all, I adore bookclubs. But before every reading, I get so anxious I am ready to be scraped off the walls. I can't help thinking and worrying: what if no one shows up? So, anyone want to share their embarrassing reading stories? Come on, Amy and I just did! OK, I cheated and used the IMac photobooth program to create this snowy looking shot, but it sure FEELS like everything is covered in snow and ice this morning. I'm headed to City Bakery for hot chocolate. We love city life! There was this incredible article in NY Mag about whether or not it was true that cities tend to breed loneliness, and the article found the opposite. Cities breed community, and as one person said, "which is more lonely? Walking down a crowded, electric NYC street with all that culture booming around you or sitting on a porch in a tiny town staring out at miles and miles of empty road." Suburbs and tiny towns have more weird crime and are less diverse, which means less tolerance, too. (Yes, Sarah Palin, it's true) I know some would differ so please feel free to chime in--and I have a friend who moved from the city to a small town and loves it (and we love her). What can I say, I think it depends where you heart lies, and we are all city people and I feel like this is a great gift we are giving Max. This is a great piece from the New York Times about why publishing gives million dollar advances to the likes of Joe the moron plumber, while real novelists are struggling. Publishing talk and my essay available from Random House online! I am thrilled and honored to report that my essay, The Grief Diet, in the soon to be published Random House anthology Feed Me, edited by the sublime Harriet Brown, is now posted as one of three essays online--part of a sneak peak. I truly am honored (oh, I said that already.) It was from a difficult time in my life, and I hope I turned that into art. Changing gears, I want to talk about publishing in general. I realize I am going to sound naive, but with all the horrific things going on in publishing, I wonder if there is a better way to run the whole business. Because books are so expensive and money is so tight, wouldn't it make more sense for publishers to do away with hardback/paperback and just put everything out in trade paper? Cheaper books mean more readers willing to take a chance on unknown authors, which means profits, no? I also feel these huge advances, which are often unearned, are also killing the business. If a publisher cannot recoup a $500,000 advance, there is that much less profit for them, and we all know what much less profit means. We've seen it all this week with the firings, with Harcourt Houghton Mifflin not acquiring new books. Art matters. But am I totally naive? I am thrilled and honored to be the Saturday Shout-out at Gina Sorell's fantastic blog. Gina is a fantastic actress (watch for her on an upcoming episode of CSI) and a really, really talented writer. She was handpicked to be in my advanced novel class at UCLA and her novel, which is wonderful, is just now making the literary rounds. I really am thrilled and I hope you will go and read her blog, in any case. I am addicted to it. Thank you, Gina. A million times. We are off to see Cadillac Records, then eating at Whole Paycheck (Whole Foods) then romping in the city and then dinner at a veggie Cuban place. Meanwhile, I now have 150 pages of my new novel and when I have a draft, I am going to try Cari Luna's (she is a fabulous writer--and thank you Cari for the idea ) idea of opening a new document and retyping and rewriting. This is actually the way writers worked before the bliss of computers. My 1000 words a day pact with writer Clea Simon has also been inspired. We both did 1200 or so yesterday and it feels so great so see those pages add up. Meanwhile, I have one more revision in my script! See you later, alligators. I'm off to the movies! I just posted on facebook that I have been writing about the past so much I am unclear about the present. It happens to me a lot. I get so deeply involved in the world of places and characters that the present world begins to fade a little. There is always the sensation of coming up from underwater and blinking at things, trying to refocus. When it's fiction, it's absolutely magical. And when it's fact, it's a little more disconcerting because sometimes, you have to revisit the scenes of the crimes. For most of the writers I know, memory is fierce, strong and indelible. I'm a really happy person in my life, and my husband and son are fabulously sweet and silly, but I gravitate to writing about dark or serious issues. I love drama! My agent always tells me she loves reading about pain! (My son's in a drama company and the producer asked me, "why does such a happy person write such dark books?" Well, I think the answer is that is WHY I can be such a happy person!) Anyway, I can catapult myself back to events in my past for nonfiction, and sometimes it isn't always so much fun. I have been known to weep at the keyboard, or get tense and feel threatened. I remember in detail every word someone said to me years ago and what I felt. Last year, at a reading in NYC, I was reading about my one real job, where I was told that because I was a novelist, I would probably be blamed for all errors since everyone would know I was thinking about myself rather than videos. The same job turned out to be a nightmare when I miscarried a child before we had Max. Anyway, as I was reading, I forgot the audience, and for a moment, I was there again, standing in my boss's office, angry and stunned and sick. People in the audience told me later that there were sparks coming off that reading. "What an actress!' someone told me, but the thing was, I wasn't acting. (I am a terrible actress, as evidenced by my stint in my high school drama club!) I was simply there. In that moment. Reliving that past. Writing about the past is a way for me to make sense of it. To give it shape. To hopefully make it into art. And sometimes just to let it go. 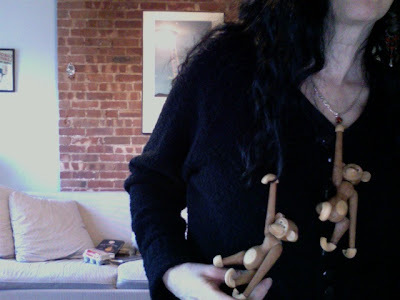 When I was a kid I had these great wooden monkeys, which I, of course ignored and God knows what happened to them. But recently, I refound them for $12 a pair on Ebay! Turns out they are famous little (and expensive, going elsewhere now at $200 a monkey) critters, designed by renowned artist Kaj Bojesen. Who knew? Here they are hanging around on my hair and my sweater. I'm a little giddy getting off off odious dial-up, but being off line gave me a huge chunk of time, and I just finished, writing 2000 words. All of this makes me think I should NOT get online until my work is done, despite the siren song of email, facebook, twitter and gawker. It is an amazing feeling, doing that work today. We are waiting for Cablevision to come here and fix the connection so we can use our beloved Macs. Right now, the only way I can get on line is with dreaded dial-up (go on facebook, take a shower, and by the time you are out, you can get on again) and my old Dell. I'm not happy about this at all, but at least I can still WRITE on my Mac. The wonders of online is that in the space of two weeks I have discovered two other writers who share my beloved agent--which is wonderful and comforting. Without quick access, I feel so cut-off! I can't even post the photo I wanted to, which is of these two amazing teak monkeys I had as a kid which are now worth hundreds of dollars (but I am keeping them.) I have the name of the famous toy designer in my IMac which I cannot get! It is hard to work waiting for the Big Fix! I finished a client's manuscript evaluation (love, love doing this, love it with a passion.) The script has another rewrite to go. The novel is now entering the "too much is written to turn back now" phase, where the honeymoon of the first chapter has given way to the anxiety about the midsection. Is it working? I worry so much that the main, driving idea is awful, but I have been obsessed with this particular idea for so long that I really want to make it work. I somehow cannot let go of it. Here's to a speedy recovery of all systems. 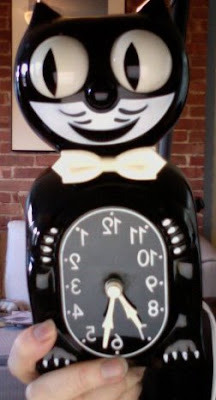 Clea Simon and I are swapping notes again, this time about whether or not certain times of year are more condusive for writing. Please check out her great blog for my response. And thank you, Clea! Now that Thanksgiving is done, I'm reading lots about "seasonal" mysteries. Everyone wants to read a story about the holidays, a "killed by Christmas" mystery, or a "let it snow" essay. Of course, for those to come out now, they were probably written over a year ago, and maybe in the summer. But they have made me think: Do we write differently in the holiday season? Or just as winter approaches? In some ways, it's hard for me to judge. Up here in New England, the weather has turned unseasonably mild. The thermometer says 59, which is warmer by far than it has been for weeks here. And I haven't started any of my gift shopping (or making or baking). But I do know that once the mercury sinks again, I'll be in the mood to cuddle up and read a good book, so why shouldn't I want to cuddle up and write? After all, when it's dark and grim, the idea of a fictional escape is even more tempting than usual. And when it's cold and wet (or simply cold), I find it very hard to go outside. So if I lose hours of writing when the weather is gorgeous and the birds are calling me outdoors, maybe I make up for it during the short, dark, harsh days of winter, when a cat and a computer tempt me far more than a walk. As for the holidays? Well, for me they are a distraction. A wonderful distraction, mind you, filled with friends and food and sparkly earrings that I never wear the rest of the year. I love them. But as far as helping me write, well, no they don't. Except when my friends start asking me just what I'm working on now and as I start to tell them, the ideas start rushing out... like presents I'll give myself a little later, when I have time and quiet, in the cold, dark days to come. I first encountered the works of Amy Koppelman when her first novel, A Mouthful of Air, came across my desk. It was a summer filled with breezy reads, and this book, about a young mother's postpartum depression, promised something more substantial. I devoured the book. I loved it so much I build a whole Boston Globe column, "Let's Hear it for the Unhappy Ending" around it. Koppelman's second novel, I Smile Back, is equally ferocious, beautiful, and unforgettable. I asked her, "What's it like being a novelist the second time around, and here is her very thoughtful response. Thank you, thank you, Amy. I thought that it had to get easier, that the second time around I would have more confidence, which would invariably lead to more productivity. I wouldn't be timid about bending a sentence this way or that because the last time I bent someone bought. I was certain I would find validation between the hard covers and deckled edges. So much so, that I might begin to call myself a “writer”--might even say “I'm sorry, I can't meet you for coffee because I have to write.” That's what we writers do right? --we write. Yes, if only I could get my first novel published I'd be part of the we- and my second novel would pour out of me like (and I'm one who takes issue with simile) melted chocolate from a gravy boat. The thing is, a blank sheet of paper is exactly that-blank. An 8x10 inescapable white surface that you must fill with letters. Letters that form words. Words that build sentences. Sentences that comprise paragraphs. Paragraphs that hone thought. Thought that sustains chapters. Chapters that link a narrative. A narrative, and this is where it gets tricky, that means something. You are, after all trying to say something. That's what we writers do right? -we say something. Yes, if only I could get my first novel published I'd be one of those people that espouses. Morality would spring from me (and I'm one who takes issue with metaphor) like oil from a well. What's more I had a plan. I was building a career. A small press leads to a big press. I would recoup my advance, I would sell out my printing, I would be operating in the black. I would have reviews, a small but dedicated group of fans-- I would get another shot. I didn't factor in book scan. A friend of mine, let's call her X, sold her book for $300,000 to one of the big presses. She sold five thousand more books that I did. They lost hundreds of thousands of dollars. I got a royalty check. Aren't I the better investment? The answer to the above is succinct. “No.” The publishing world of today rarely builds careers. Editors, if they want to keep their jobs, simply don't have the time. There is so much media to compete with: the movies, internet, Youtube. If books about teenagers in New York City are all the rage you can expect a run on them. And that's not only okay, it's reasonable. Publishing is a business. I knew this back then but thought it was somehow different. I'm not sure if I answered the question since I don't have much in the way of advice. All I can tell you is this: From my experience the writing doesn't get easier, it's nearly impossible to sell a book and people don't read much fiction. What I know now, that I didn't know the first time around is that none of that can matter. For the sheer possibility, I remain grateful.